Non-medicinal ingredients: calcium phytate (2000 mg per serving), sodium stearyl fumarate. Capsule: hypomellose. Phyto C is a natural solution for those who are concerned about abnormal and unhealthy cell growth, those who want to detoxify excess heavy metals in their body or those who wish to boost their immunity. Phyto C is formulated with inositol hexaphosphate (IP6), also known as phytate, and vitamin C. IP6 is naturally found within the fibre of most cereal grains and seeds, however its absorption from food sources is not always good because it is tightly bound to other elements within the fibre. Because of this, IP6 should ideally be consumed from supplemental sources to be effective. Due to its strong binding affinity, it is a potent chelator. Chelators can bind to heavy metals such as aluminum, mercury and cadmium which we absorb from our environment, and remove them from the body before they can contribute to abnormal cell growth and disease. 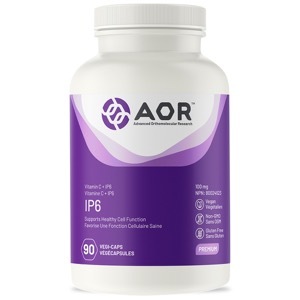 Studies have also shown that IP6 helps boosts immunity and regulates the activity and production of abnormal cells. Phyto C includes vitamin C, a potent antioxidant which further protects cells from damage and reduces the risk of developing diseases caused by unhealthy cell growth. ADULT DOSAGE: Take 1 capsule three times daily on an empty stomach, or as directed by a qualified health care practitioner. CAUTION: Consult a health care practioner prior to use if you are pregnant or breastfeeding.